Cushion coulters cut and size residue and pre-slice the soil to allow a more level soil profile. The three- and four-standard machines come with one parking stand in base equipment. 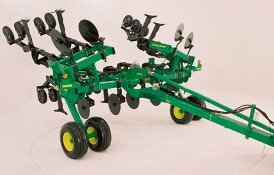 The five-, seven-, and nine-standard machines come with two parking stands in base equipment. Extra parking stands can be ordered as a field-installed bundle for increased stability. Setback brackets (1) are available to stagger the standards, allowing increased crop flow in high-residue crop materials. NOTE: The staggered standard pattern is not compatible with the four-standard machine. The 19-mm (0.75-in.) straight standard design moves through the soil, minimizing soil and residue disturbance at the soil surface. 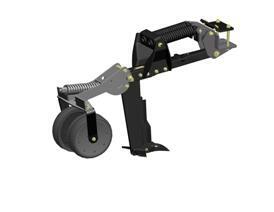 Closing wheels can be added to the rear of the 2100 Minimum-Till Ripper with 19-mm (0.75-in.) standards to minimize surface disturbance. The wheels are positioned close to the shank to allow increased trip height for going through washouts and depressions. 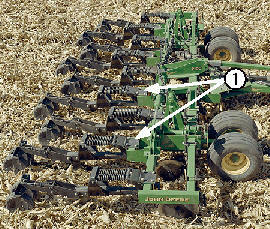 They utilize an L-bracket to attach the wheels, providing better clearance for soil and residue flow. The side-to-side adjustability is 0 mm to 356 mm (0 in. to 14 in. ), and the closing wheels attach to the shank with 25-mm (1-in.) diameter hardware.